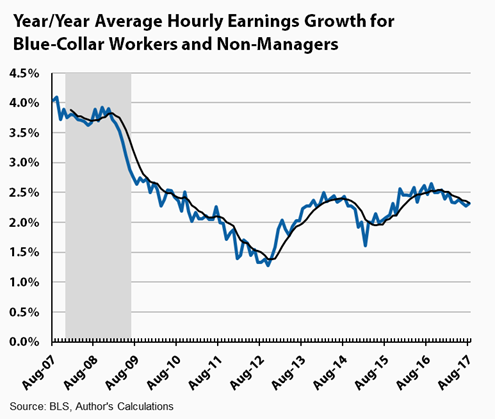 Though the report on job growth in August comes in below expectations, the labor market continues to tighten at a good clip, generating job, wage, and income growth that will continue to support the expansion. However, there are soft spots, most notably the fact that wage growth has been uncharacteristically unresponsive to persistently low unemployment. Smoothing out the statistical noise from the monthly data is a useful way to get a clearer signal as to the trend of employment growth. 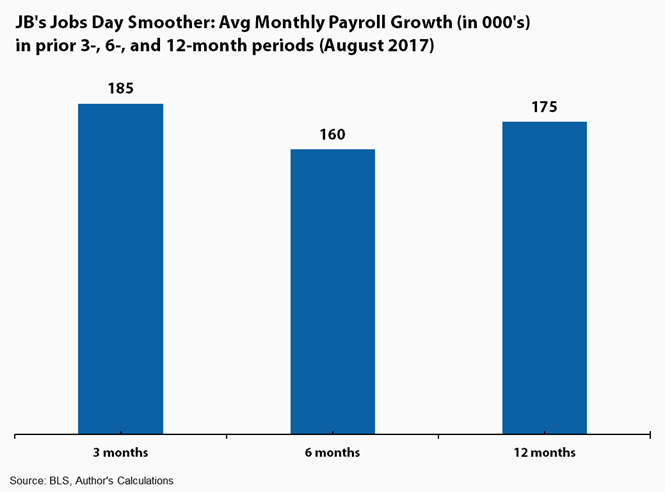 JB’s monthly smoother shows that over the past three months, monthly gains averaged 185,000, a slight acceleration over the longer-term trends, and a number that’s thoroughly consistent with continued improvement and tightening in the job market. And yet, hourly wages can’t catch a buzz. As the figures below show, for all private-sector workers, nominal wage growth was stuck at 2% throughout much of the recovery, before taking off about two years ago, climbing to 2.5%, where it has been stuck, if not decelerating a bit (as per the smoother, a 6-month rolling average). For lower-paid workers (bottom figure: the 80% of the workforce that’s blue-collar production workers and non-managers in services), the pattern is similar, though the recent deceleration looks a bit clearer. Given that inflation is still on the low side—prices rose 1.7% in the most recent CPI report—these growth rates still imply rising real earnings, though less than 1%, year-over-year. In other words, most workers simply are not sharing in as much of the economy’s growth as would be expected given the apparent tightness of the labor market. Why that is the case remains among the most important economic questions of the moment. One cogent explanation is that while the job market is unquestionably tightening, it is not yet at full employment and there’s more “room-to-run” than the 4.4% unemployment rate implies. The most telling indicator for this argument (along with the wage results) is the employment rate for prime-age workers. It fell three-tenths of a percentage point last month, though it’s 3.6, 4.5, and 3.4 percentage points above its trough value for all, men, and women, respectively. Yet, it still remains 1.9, 3.1, and 0.7 points below its pre-recession peak. Other explanations include slow productivity growth, which restrains average wage gains, and, even at low unemployment, weak worker bargaining power. These indicators, in tandem with notably weak price pressures, should definitely lead the Federal Reserve to question the necessity of tapping the economic brakes by continuing their “normalization” of interest rates, i.e., their series of planned rate hikes. As today marks the start of the Labor Day weekend, this last point is worth digging into a bit. As I stress here, unionization remains at historically low levels, in no small part due to aggressive anti-union activities. Meanwhile, the Trump administration has consistently been pursuing anti-worker measures, such as failing to raise the salary threshold for overtime work or the minimum wage, while deregulating labor standards and worker protections. Note this timely comment from the president in a speech from earlier this week selling his tax cut plan (which does not yet exist); he asserted that “It’s time to give American workers the pay raise that they’ve been looking for, for many, many years.” I agree. Yet, none of the components of the plan that have been floated thus far—eliminating the estate tax (!!) and the alternative minimum tax (measures that would help those like Trump and his heirs), cutting corporate taxes, zeroing out taxes on foreign earnings of US multinationals—come anywhere close to helping families that depend on paychecks as opposed to stock portfolios. What’s needed are measures that will boost the bargaining power of many in the workforce, not tax cuts for corporations and the wealthy. –The impact of the hurricane is not present in today’s numbers. The employment surveys take place in the week that includes the 12th of the month – in this case, well before the storm hit. –Large storms like Harvey typically show up first in weekly unemployment claims, which are likely to spike in coming weeks. –September’s jobs report (released on October 6th) may reflect some impacts of the storm, though they could be offsetting. That is, employment in the affected areas will be disrupted, of course, which could show up in slightly reduced payrolls or fewer hours worked per week. Conversely, by the September survey week, some clean-up efforts will be underway, and those could create perhaps 10,000-20,000 temporary jobs. All told, I doubt that Harvey will be a significant, direct factor in forthcoming jobs reports. –There could, however, be indirect economic impacts from the storm, though these too could be offsetting. First, the temporary loss of a third of the nation’s refining capacity has led to a spike in gas prices, which hit a two-year high yesterday, up 14 cents from a week ago, to a national average of $2.49. Higher gas prices cut into disposable income and could temporarily dent consumer spending. Conversely, rebuilding and replacing damaged cars, structures, roads, etc. will boost economic activity in coming months. Harvey could shave maybe 20 basis points off of Q3 GDP, which would later be made up in future growth numbers. Share the post "Jobs report comes in slightly weaker than expected, but the real problem is slow wage growth"
3 comments in reply to "Jobs report comes in slightly weaker than expected, but the real problem is slow wage growth"
This was typical for August sampling and there was nothing to see here. General inflation has fallen since the DeGaulle gold crisis fully ended in the 90’s. 2.5 wage growth is the average, period. It is not weak. It is not booming. When you understand that, you get the picture. You try to create dialectical illusions. Stop. 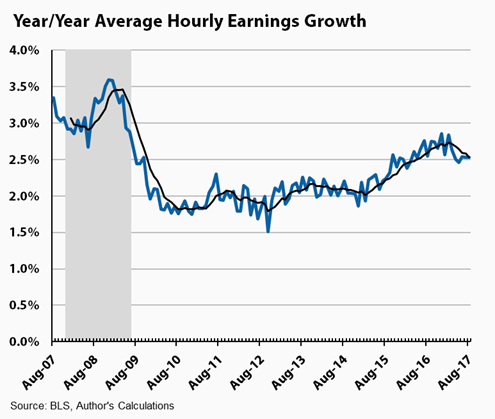 If wage growth spikes above 3% in a low oil price environment, then you are booming. Oil prices killed real wage growth in the 00’s. If they would move up to 100$ wages would grow 1% more but the real value would be lost. The cola component is very important at this stage because of the cost adjustments size is large. Your point about the Fed is irrelevant. This is when the tightening must start and no, they are still loose and have the effective rate below the rate of inflation. The labor contract is broken. Many more employees are contractors hourly wotkers with a fixed length of up to 1 1/2 year no vacation holiday or sick leave pay. Lenders will not approve home loans for us. Many of us have been victims of mergers and compsnies find enough contractors to fill these just in time jobs so the hourly pay has not gone up on 10 years. I. am a certified project manager and by contracting companies save lots of money! Job growth was stronger in August than in July, but the seasonal hedonics make the illusion that is what not. Analysts keep making this mistake and it is frankly, getting old. The BLS sampled the week of the 12th. What is not in session during that week and who don’t they count? This is just one annoying example of those seasonality in August. Unlike February, which has had a tendency to overestimate job growth, August usually comes in flat. Perma bears are desperate and its shows. Even monthly wage growth has been solid 2 straight months. The only reason for the leveling off the first half of the year was due to the dollar surge, cola adjustments getting revised downwards. September/October should begin to reverse that out(and Harvey may have a slightly stimulating effect longer term like Katrina).